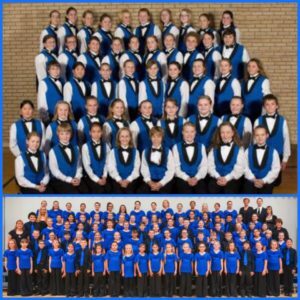 The Greeley Children’s Chorale is a strong choral organization founded in Greeley, Colorado in 1990 by Kay Copley. We provide a structured, caring environment where children gain valuable musical skills. With high standards, we help children aspire to be their best in musical artistry as well as personal development. The Greeley Children’s Chorale exists under the auspices of the Greeley Children’s Chorale, Inc., a non-profit corporation, and is run by a parent and community volunteer Board of Directors. The Greeley Children’s Chorale consists of two auditioned groups: Peak Performers (grades 5–8) and Summit Singers (grades 3-6). Students audition from all areas of Weld County, Colorado. Special projects during our existence have included premiering newly composed works, concert tours and exchange concerts. In 1994, GCC produced a PBS quality videotape of The Christmas Story written by Carl Orff and Gunild Keetman. This was the first video production of the work and the first recording in English. The movie earned an International “Telly” bronze award for short subjects. One of the Chorale’s highlights was the tour with the Greeley Chorale to Oklahoma City and the performance of Requiem for the Children: All the Pretty Little Horses, a piece composed by Dean Rishel in memory of the children who died in the bombing tragedy there. The Peak Performers have been selected several times from choirs across the nation to participate in the Sing A Mile High International Children’s Choral Festival in Denver, Colorado. The Children’s Chorale has appeared with the Greeley Philharmonic Orchestra, the Greeley Chamber Orchestra, the Youth Orchestra of the Rockies, UNC Choirs, and the Greeley Chorale. Performing our own a cappella version of The Star Spangled Banner has become an annual event at UNC Bears football games, Colorado Rockies games, and Colorado Eagles games. GCC has appeared multiple times at the Colorado Music Educators Association conference, most recently in January 2016.